Our studies were interrupted by Hurricane Sandy and related evacuation orders and bans on travel. Fortunately Cape May saw minimal damage from the storm. 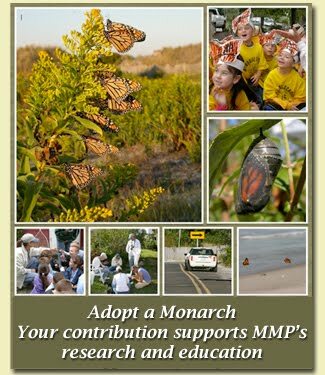 Censuses resumed yesterday, the official last day of the monarch season, and a total of 2 monarchs were counted. Thanks to all of the volunteers who helped with our project and to the hundreds of visitors who came to our tagging demos and met informally with our team as we worked in Cape May Point. Monarchs are already arriving into the mountains of Mexico. We wish them well through their winter of dormancy and to next summer's generations in temperate North America. We'll be counting and tagging again next autumn. We came down a month ago to one of the Butterfly tagging events and saw thousands of Butterflies, mostly Monarchs. Great presentation during that tagging event and we certainly enjoyed your email updates this season. Would love to see a large roost of thousands in person someday. I enjoyed the tagging event and look forward to next year's season. Thank you for the excellent and engaging presentation.